I was in Nepal in most of October, hiking through the Himalayas, munching on momos, and enjoying the local culture. One thing that is quite visible as I wandered around the Kathmandu valley was that there’s a long tradition of amazing wood carving in the architecture. Each window and door jamb and lintel has amazingly detailed Newari carving. First, a brief ethnic background. Nepal is a country of many ethnic groups - the two biggest groups compose less than 30% of the population and there are 18 groups that comprise more than 1% of the population each! The Newari are one such group, just under 5% of the population as of 2011. The Newari are the historical inhabitants of the Kathmandu Valley and its surrounding areas in Nepal, and are major contributors to the artistic and cultural community in the densely populated Kathmandu Valley. Among their many artistic contributions are the elaborately carved wooden windows, a distinguishing feature of traditional Nepalese architecture. The artistry reached its peak in the mid-18th century, visible on palaces, private residences, and sacred houses. 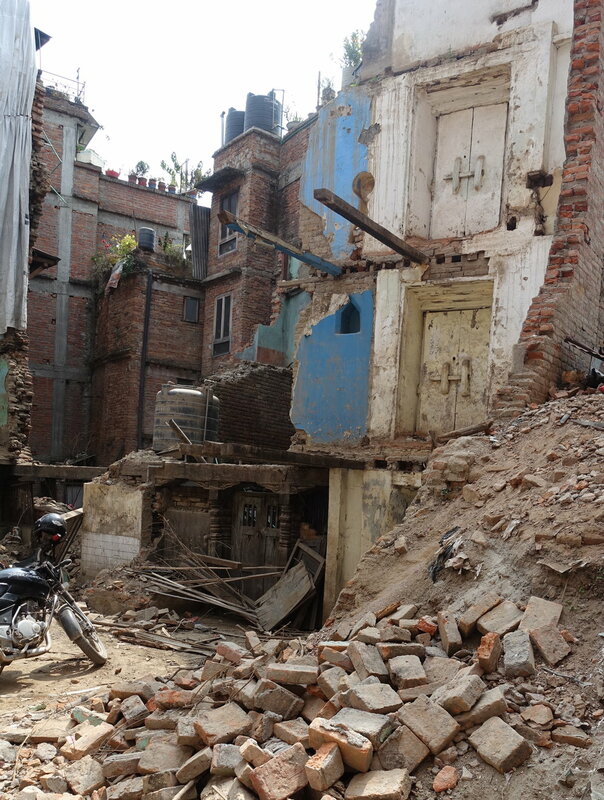 Though many historical sites - and the Kathmandu Valley region in general - suffered immensely in the 2015 earthquake as the traditional local architecture is primarily made of brick, many of the homes and buildings with these amazing carvings are still standing today. 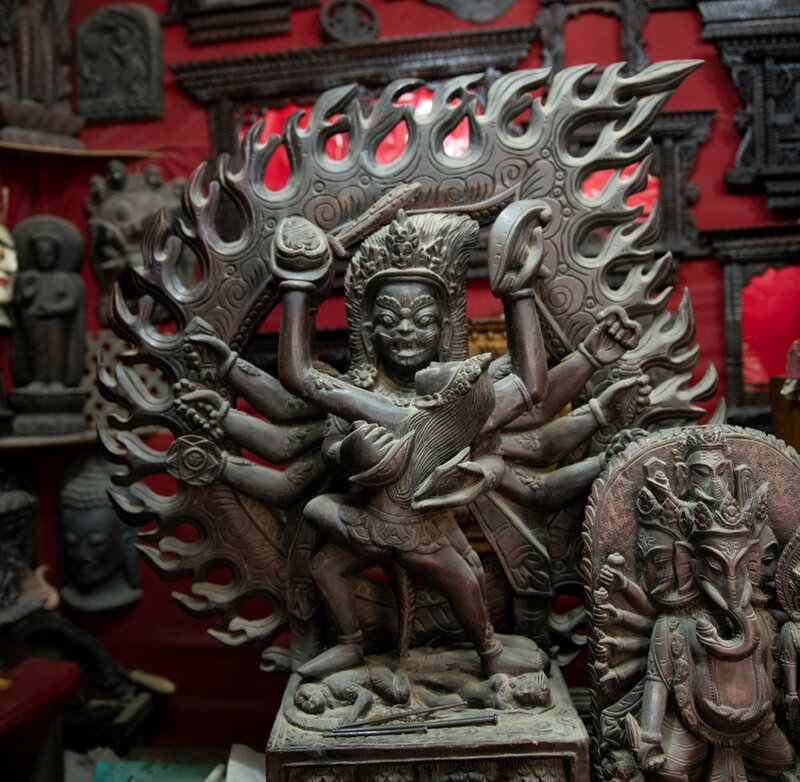 A few very talented master carvers are helping to recreate those pieces, restoring those devastated older homes, as the stretched-thin budget of Nepal allows. Via Backstreet Academy - a website that connects travelers directly with artisians and local tour guides working for themselves in Nepal, Cambodia, Laos, and elsewhere in Southeast & South Asia - I connected with one of those skilled craftsmen, Heera Ratna Bramhacharya, for a four-hour one-on-one class in his home & workshop. Practicing carving straight lines, more difficult than I expected to keep it at the same depth! Heera is an amazingly patient instructor - after taking me through a few basics and an introduction to the handtools, I practiced on one side of a small plaque before doing the “final” carving of a Nepal “sign” on the other. In addition to selling pieces in his small shop - about half to tourists and half to locals - he supplements his income with these small and one-on-one classes, as well as aiding in some of the rebuilding efforts. My finished piece. Though I’m happy how it turned out… I think I’ll stick to my current area of expertise! Originally from Bungamati - a village about 7 miles from the center of Kathmandu - Heera learned woodcarving from both his grandfather and father. And in addition to teaching tourists like myself for interest, he also teaches local women who supplement their family income by carving small ornamental strips for him that he then incorporates into his larger pieces. While smaller pieces were fairly inexpensive, don’t get planning too much ahead: for those looking to incorporate one of these amazing windows into a coming remodel, something like this might cost about USD$20,000! This bay window set on the upper floor might cost $20,000! Extra for the “peaceful” dog.